A complex dish with an unusual combination of spices, souring agents, and the star vegetable that’s actually a condiment! I have made bhaghare baingan which is very similar, but made with eggplant/brinjal. This year, I am getting a bounty of slim, long green chilies in my garden and was searching online for suitable new recipes, and ran into this. I have never actually had this dish in a restaurant but decided to make it, since we love bhagare baingan. 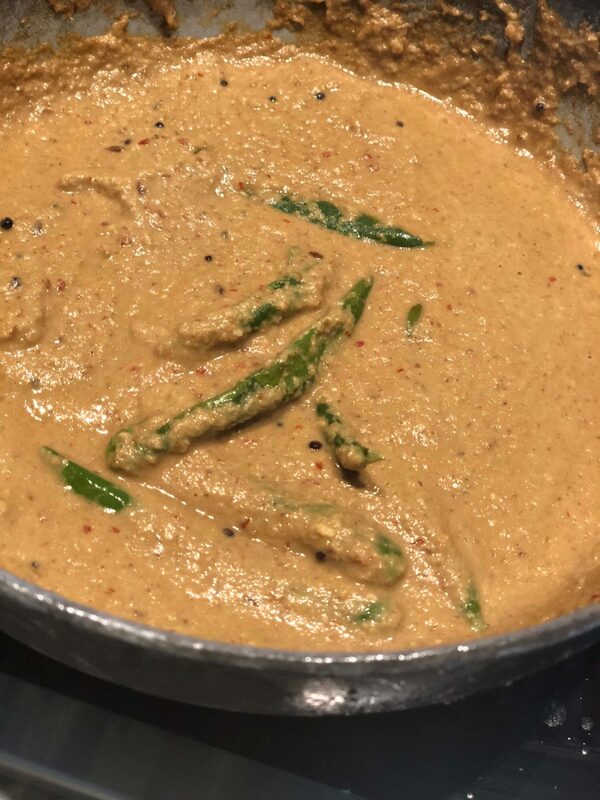 While looking for recipes, I did some research on the origins of the dish, and came across the fascinating story of how green chilies made their way into India. Hard to believe, but they are not native to India, considering how much every cuisine of India uses them, and how seamlessly integrated they seem, as to make one think they are native to India. Nope, just like tomatoes, they were brought to India by the Portuguese, specifically the famous Vasco da Gama who brought the saplings wrapped in moss as a gift — he picked them up from Spain, Brazil and Africa! In return, he took home the precious black gold, aka pepper! By the way, I learned that Akbar was a staunch vegetarian! Wonders never cease, and Akbar continues to amaze me. This dish, with the influence of Karnataka, Telengana, and Marathwada cuisines, apparently appealed to Akbar’s “unifying Hindustan” sensitibilites. I love food stories! On to the recipe now.